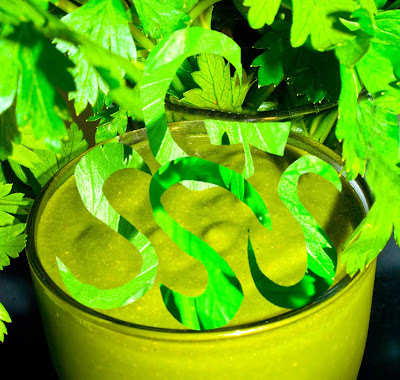 sunday super salad green smoothie- clean out your fridge! hi- this morning I used ALL the leftover edible greens lurking in the fridge before restocking with another week of green smoothie essentials- there was some tatsoi, beet greens, chicory, choy sum and dinosaur kale. I also unearthed a bunch of herby looking greens called green shiso that I bought last Sunday and haven’t used yet. Shiso?? That was my reaction too. So once again back home to Google- it’s what the Japanese call perilla- a member of the mint family. I’d heard of perilla oil and perilla supplements but never seen the herb. So I was excited to try a new green even though it’s taken me all week… it is also called Japanese basil, purple mint or wild coleus. Perilla is traditionally used to treat colds, coughs, chest congestion, bloated stomach and abdomen, nausea and vomiting. The smoothie combined with frozen mango and peach / lime and lemon tastes great- the perilla is slightly peppery and sweet I think and adds a new flavour. I am really trying not to overbuy then have to throw out uneaten food. Green smoothies are perfect when you are trying for a zero waste policy! I love the farmer’s market because of the small scale and there is no overt brand pushing and product placement to get through like in supermarkets- the source of much of our over buying and food wastage. I think they are nicer places to buy your stuff from- actually talk to the person who is growing your food. But best of all to curb any reckless spending and over buying…it’s cash only and there’s no eftpos…!